1. When flying on a domestic flight out of Terminal 3, you should always go through TSA security checkpoint near Gate 74 and 75. 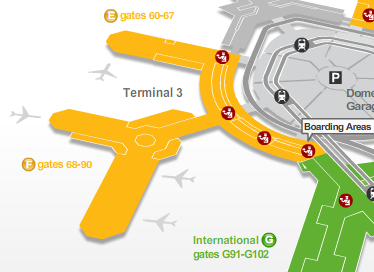 Gate 74 and 75 is located between the domestic and international terminals. It is called out “Boarding Areas” (the bottom red dot) if you refer to the map below. The Gate 74 and 75 checkpoint is to the left of the Ticketing area, opposite side of the regular boarding area. No one is aware of this security checkpoint as it is geared towards travelers coming from the international terminal or BART. Lines here are always shorter than the Premier lines. 2. When you are in transit through SFO from domestic to international terminal, the best approach is via the bus interlink. The bus is located near the Yankee Pier restaurant or Gate 72. Referring to the map above, it is the 2nd red dot from the top. You will need to go through a door near the information booth, then down the stairs to the waiting area. The bus comes every 15 minutes or so. Going by bus means you will be able to avoid going out of Terminal 3, taking the Airtrain, and go through security screening at the International terminal. Try these two tips and let us know your thoughts. Awesome post. Love the map. Just tried this today to avoid the long united line, it works like a charm.